Personalize your scripts and customize your prospecting script. Home > Why scripts? > How to write a script. How to write a sales script that makes it sound compelling and natural. How to write a prospecting script that works. Most speaker and authors describe what kind of things to say, but not exactly what to say. It is assumed that a salesperson has a higher education level thus they have the ability of write a prospecting script and write a sales script. It is easy to talk above the prospects reading and comprehension level. The average american reads at the eighth grade level and they comprehend what is said to them at a similar level. 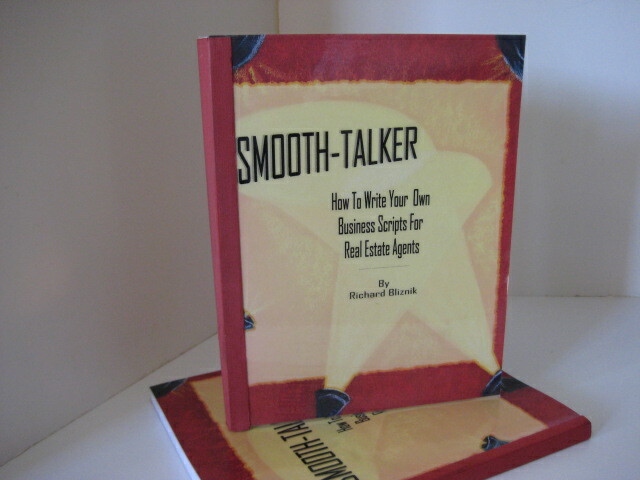 "Smooth-talker, How To Write Your Own Prospecting Script" is a book written and published by Richard Bliznik. It contains everything you need to choose the right words for prospecting for new business. How to write scripts the way you speak. The script-writing kit that comes with every Smooth-talker Sales & Prospecting Script makes it easy to write and compose scripts that will get you more appointments and get more sales. Included is a 24 page instructional booklet called "How to write a prospecting script." We know that during these tough times that salespeople cannot afford expensive seminars and training programs so we brought you this affordable instructional booklet and "Scriptwriting Kit." 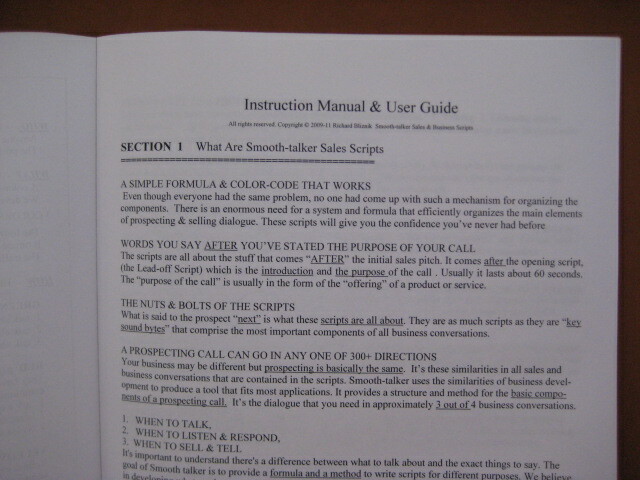 How-to write a sales script" explains in detail some of the things to consider. 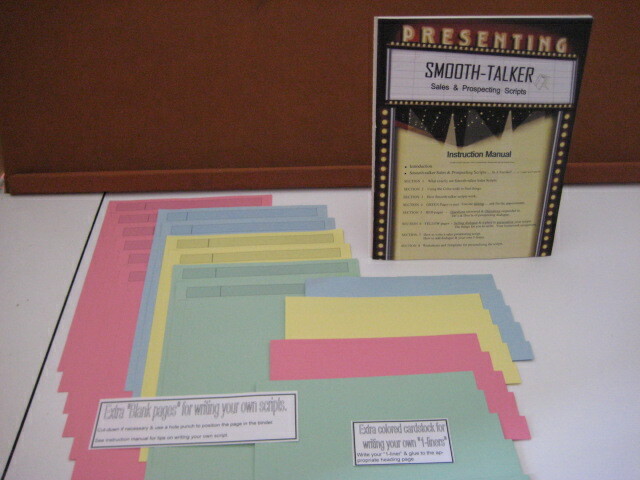 Every script includes 10 color-coded pages plus a selection of 60 pieces of color-coded card-stock for writting your own dialogue & glueing it to an appropiate page. 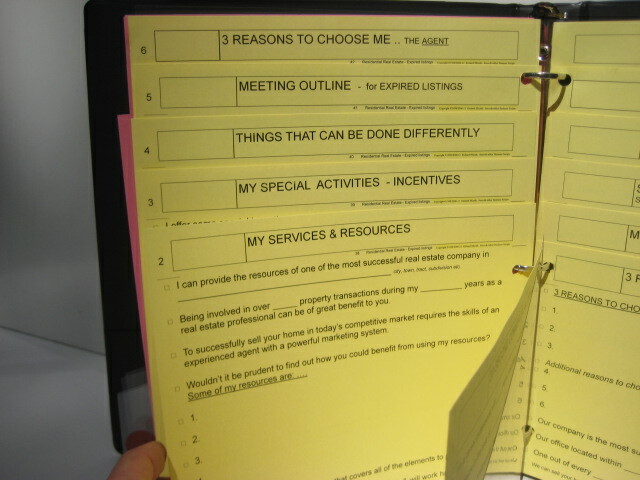 The extra pages are printed with blank headings for you to put the topics of your choice and the coresponding dialogue. The Instruction Manual contains a condensed version of my book on the basic things involved with writing a sales script. It's back to basics when writing a prospecting script. When prospecting by telephone, words can create “desire” and that desire creates the need based on what you say. Desire is a state of mind that will overwhelm nearly anything that gets in its way. There is a slight but significant difference in desiring and wanting something. When you win the hearts and minds of anyone under any circumstances you have created a winner take all situation. Substance with style. Writing a good sales script is conspicuous by the absence of unnecessary words. If you have a rapid speech rate, prospecting script will force you to slow down to meet the listener’s rate of understanding. If your rate is agonizingly slow, you must speed up your speaking rate. Your speaking rate must be paced with your listener’s comprehension rate when learning how to write a sales script. You must have the ability to combine "substance with style." Pure substance is generally forgettable. Style is memorable for its entertainment value but comes up short on getting appointment. Brief and simple dialogue is required when you're writing a sales script. How much time will you get when it's your turn to talk? Give and take conversations go on until the prospect decides that the merits about the product are not what he is looking for. It may seem unfair but that’s the way it is. No one wants to listen to conversations that are dull and uninteresting words. When writing a script, make it easy to locate the dialogue by underlining the words that describes the main point. It is of paramount importance because it will help you to find it when you need it. Writing sales facts. Prospecting scripts written by sales managers all want to share the sales dialogue that will generate new business but they have few resources available. There are few books written that can help the sales managers with how to write a sales script. When writing a prospecting script, you don't need to write a script for every conceivable situation, just those that crop up the majority of the time. Words that look good on paper may take on a different meaning when spoken out loud. When learning how to write a sales script, the same words that appear on paper must be honed and refined for verbal delivery. Your speaking rate. If your rate is agonizingly slow, you must speed up your speaking rate. Your speaking rate must be paced with your listener’s comprehension rate when learning how to write a prospecting script. You should determine the "sentences per average" sales call. The most important statistic is determining the average number of sentences of the typical prospecting call. It will vary according to the type of business you're in. Suffice to say it will be less than you think. Is it any wonder that a sales call is complicated. Sales training must be conscious of how long it takes to say something. You can speak approximately 150 to 250 words per minute. Approximately 300 words and 6 to 9 sentences would equal about 90 seconds. That's about as much as a prospect will allow you to speak. Only the best words will do. Sales trainers tell us to write a sales script in order to speak a sales script. The words you have chosen better be good or else the prospect will find a way to end the conversation. Sales training courses teaches us that salespeople overpower a conversation by taking a larger share of time than they should. They take up to two or three minutes or more. That’s why the scripts are written in short sentences. They anticipate the “boredom factor” which is responsible for impatience on the part of the prospect. Scripts are written for the rule rather than the exception. You don't need to write a prospecting script for every conceivable situation, just those that crop up the majority of the time. Words that look good on paper may take on a different meaning when spoken out loud. A lot depends on the words themselves if they produce feelings and emotions. When learning how-to write a prospecting script and sales script, the same words that appear on paper must be honed and refined for verbal delivery. Scripts written by sales managers are not always a good idea. 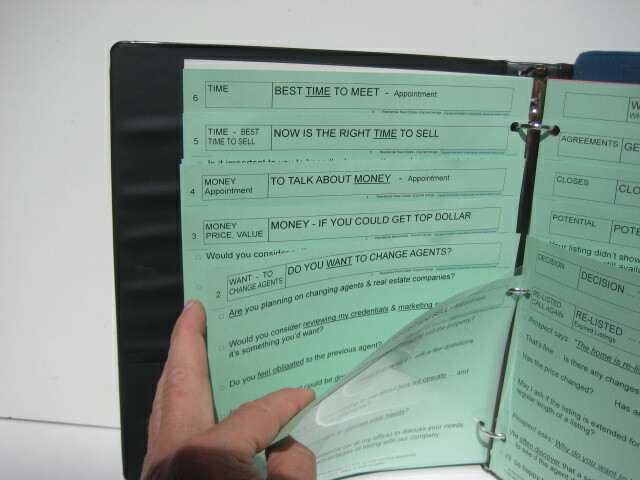 Scripts written by sales managers and sales trainers are not realistic for the real world of prospecting. They all want to share the sales dialogue that will generate new business but they have few resources available. There are books on selling but not on how to write a prospecting script. There are few resources or "How-to" books available that you could turn to for well conceived and properly worded sales script. There were no clear, concise, and easily spoken sales words to use. There were lots of How-to books that contain words that convince, persuade, and sell. 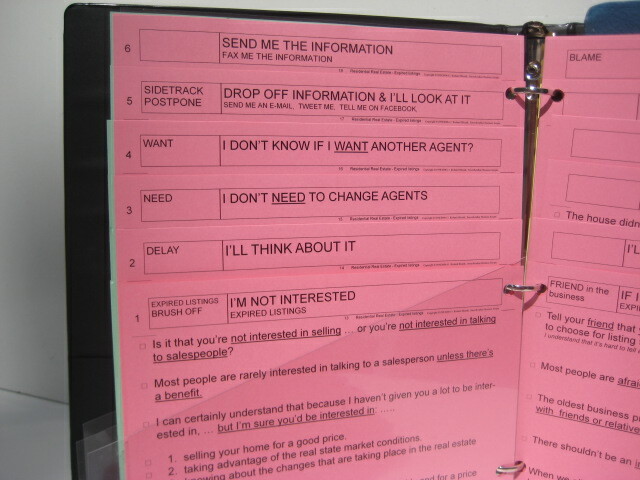 Sales trainers and sales managers determined that the objective of a sales script is to get an appointment .. not sell! Sell when you get in front of the prospect. Written paragraphs have a major point and several minor points but not in scriptwriting. Most paragraphs should have one main point and several minor supporting points. Supporting points elaborate on a major point and are the main components of normal paragraph writing. This structure seldom permits a single sentence from wandering away from the theme of the material. It should be at the forefront when a writing a prospecting script. Out of context sentences are easily spotted and edited out so the paragraph makes sense. If a prospecting script contains several major points, the prospect may become irritated trying to absorb your selling message. Noun & verb .. verb & noun .. whichever sounds best. An effective technique of how to write a sales script is to use the "reversing techniques." Listen to the words of a sentence and determine which order of noun / verb sounds best. Doing so can shorten the sentence which is the objective of writing a sales script & prospecting script. Even a wild idea could have merit because it leads to more creativity. Prospecting scripts should be written from the heart. Write to the heart instead of a prospects sense of logic. Match the message to connect to the prospects emotions first and logic second. Prospects respond to what they feel, and all logic in the world won't change their mind. All too often consumers buy what they want whether they need it or not. Whomever appeals to the emotions controls the heart. Once they set their heart on something, no amount of logic comes between what they need. It is well known that prospects get highly attached to their own emotions. A lot depends on the words themselves if they produce feelings and emotions. Dialogue should be aimed at the emotions. Develop you own style of writing sales scripts. Choose a style that compliments your personality. Your business writing style should reflect the way you normally express yourself because you’ll probably meet the prospect in person. Your unique style and your personal characteristics are what identify you to others. Write naturally and write the way you talk when learning How to write a sales script. When you are talking on the phone it won't sound like you are reading from a script because they are to be written to match the way you actually talk. Other uses for the scripts. In a face to face meeting with a prospect, there will be occasions that you’ll have the advantage of being able to paraphrase your written sales scripts and prospecting scripts. You may write something for the sales script that will work equally well when face to face with a prospect."